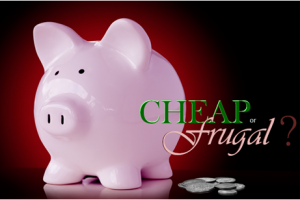 Are you Cheap or Frugal? Take our quiz to find out. I love getting a good deal. Bu y one-get one free. Double store coupons. Generics as good as or better than the brand name. But some people equate an expensive price tag with a better product – you know, the “You get what you pay for” crowd. When it’s something that has value, like avast! Free Antivirus, or a big screen TV for dear old dad, then free or deeply discounted means a good deal for me. That’s the difference between being cheap or frugal. Cheapskates only consider the price tag. They will always buy the cheapest thing with the goal of keeping their money. Being frugal means making the best financial decisions I can, which means I want to maximize the use of my money. Sometimes that means spending more for better quality because over time the product holds up or it gives me a better experience. Sometimes it means not buying anything at all. People who are cheap or frugal share some of the same characteristics. Here’s an unscientific quiz to help you figure out which one you are. When you eat fast food, which of the following do you do? Fast food?! I have a freezer full of stuff at home! Fast food?! I only go to real restaurants! Buy invitations, party favors and gravestones at 75% off. Now you can afford a party next year! Mostly 1s - CHEAPSKATE: You are so concerned about saving money that you are getting obsessed. Loosen up and enjoy life a little! Mostly 2s – CHEAPIE : You like nice things, but you would never pay full price for anything. You find bargains on clearance, but sometimes you’re disappointed. Mostly 3s - BARGAIN HUNTER: The word "SALE" is irresistible. You love hunting down a great deal. But you buy things that you never use or don’t like, just because they are on sale. Mostly 4s - SMART COOKIE: You are artfully frugal. You do your research to balance quality and cost against your budget. You rarely buy things you don't need, and you stock up when something is extra cheap. Mostly 5s – BIG SPENDER: You could benefit from being more conscientious about your money. Start by switching your expensive, ineffective antivirus to avast! Free Antivirus or take advantage of an avast! Black Friday special coming in just 7 days!